A recent study showed diffuse muscle trigger knots about the shoulder in impingement syndrome, highlighting the fact there is considerable peripheral and central sensitization. Measures dealing with this disease must deal with these issues. Exp Brain Res. 2010 May;202(4):915-25. Epub 2010 Feb 26. 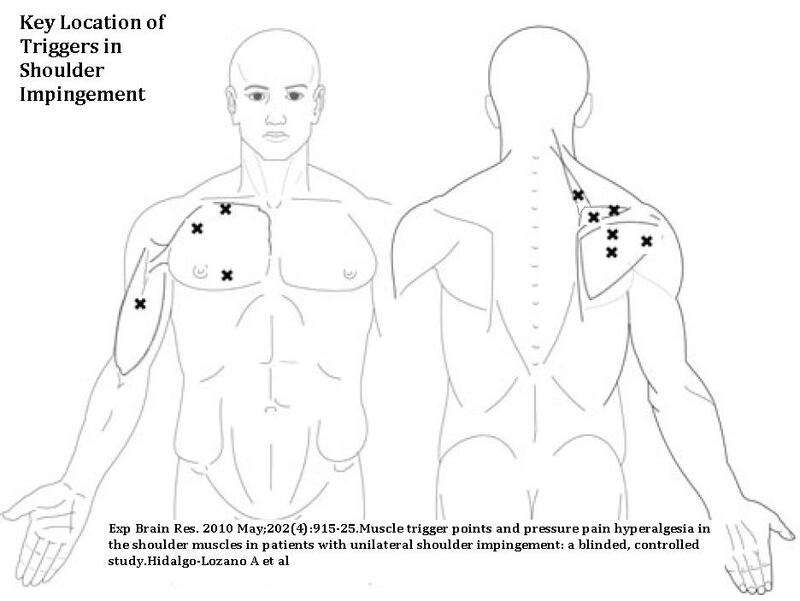 Muscle trigger points and pressure pain hyperalgesia in the shoulder muscles in patients with unilateral shoulder impingement: a blinded, controlled study. 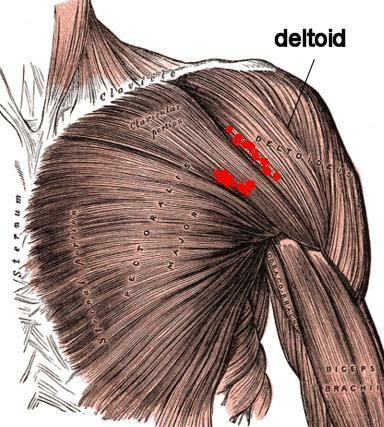 Hidalgo-Lozano A, Fernández-de-las-Peñas C, Alonso-Blanco C, Ge HY, Arendt-Nielsen L, Arroyo-Morales M.
Anterior deltoid showing very anterior (what pic calls clavicular portion) and a more lateral portion. Between these two bundles can occur a very neuropathic tender area. I suspect there is a nerve which courses with the blood vessel circled below and it maybe become involved in a form of micro-entrapment -making the muscle neuropathically spastic and tender there. 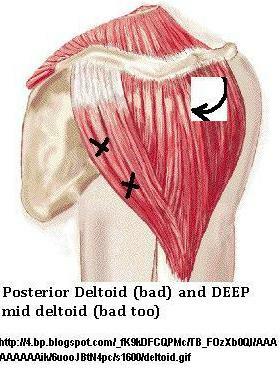 I will tangentially push on deltoid fibers to try and stretch (and tear adhesional elements) for 5 min+ and then attempt to knuckle muscle free of spasm. Gasping deltoid and shaking it back and forth can loosen it up over time as well. Central Sensitization – The brain is forever changed in chronic pain and is set to specifically tune to the pain. The pain gets linked to emotional elements and so, not only do you hurt, you emotionally suffer. Peripheral Sensitization – irritating inflammatory elements (alas, more cytokine so anti- inflamm drugs do not work), nerve hypersensitivity, and spastic muscles that create local ischemia make the actual tissues tender beyond expectation as they develop a life of their own. Suprascapular nerve block (using bupivacaine and methylprednisolone acetate) in chronic shoulder pain. E M Shanahan et al. Ben-Aviv D, Boparai N, Wong D, Luu B, Kim E, Mitra R.
This seems to relax the subscapularis muscle as well. 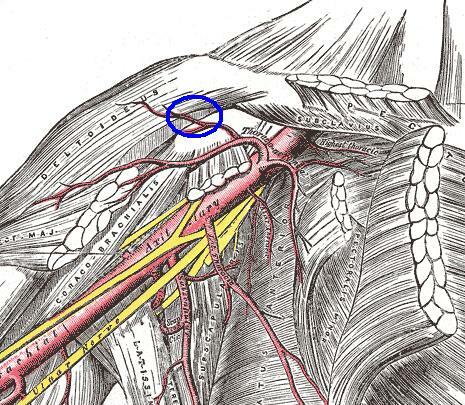 It, however, does not help the pain in levator scapular, first rib-scalene complex, and the anterior deltoid. 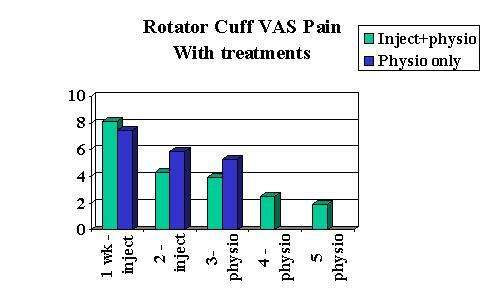 A recent study found both pulsed radiofrequency and intra-articular injedction helpful in painful shoulder. The steroids were better especially in the first few weeks. 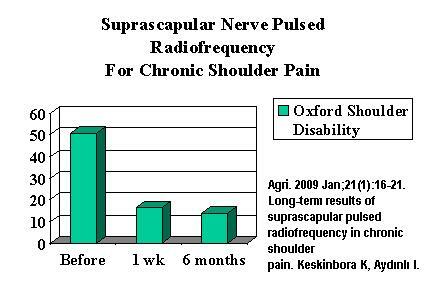 In severe cases , I have been combining intraarticular or subdeltoid bursal injections of steroid with semi-neurolytic injections of suprascapular nerve with rather nice relief though do not have stats on length of relief. I work those muscles that are “spastic” and seem to be getting some results on the shoulder impingement issue, depending on how much the neck is a player in initiating the pain. Comment – Shutting down the pain site nerve temporarily helps reset the pain centrally and decreases the problems peripherally, giving local treatments a chance – it is not a cure-all though. 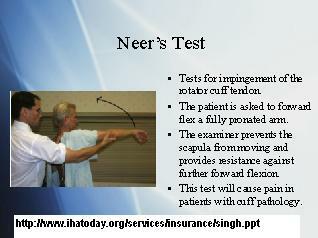 Wow this is just another great solution to alleviating shoulder pain. Are there enough evidences that this treatment provided great results? Alas, Shoulder issues are so multifactorial I have not a good handle on it and can’t say I get people back to work. 1) Many are too far gone and surgery is a necessary start. Facet blocks are helpful as well but could kill if radicular artery is threaded in process; I have been trying injected Botox into facets with some results – but only tried for neck and shoulder tip. 3) The spastic muscles cause nerve micro-entrapments that become proficient pain generators in themselves – I have seen spots in anterior (that I circled in one pic) and the posterior deltoid that would not settle with regular trigger injections and stretching – and required semi-neurolytic (temporary sensory nerve killing) lidocaine to get any progress. 4) Any excessive tightness of shoulder muscles will aggravate impingment and I work very hard to loosen muscles up around joint. The posterior joint ligaments can become very tight and cause impingement. 6) Shoulder tip pains often become confused with shoulder complaints – these seem to issue from the scalene – first and second rib complex. Treatment of this condition is a blog note all in itself. -Anyone interested – let me know. 7) There is a reversible brain damage by the constant barrage of pain signals- and you can tell it exists by the depressive symptoms it elicits. Not only that, in chronic pain, the pain memories become linked to emotional memories and ideas – this causes a new pain condition – suffering, defeat and dread of future. Curr Opin Neurobiol. 2008 August ; 18(4): 464–468. All one needs is a case worker who tells a victim “I can cut you off at any time” [Unbelievably one case worker will do this…] – and that link can be established. When pain intrudes into one’s thoughts, not only does the pain memory get elicited, but the emotionally linked memory gets evoked – spelling misery. I, alone, cannot break through that level of sickness. have recruited a meditation expert, Roger Bartholomew, to help with one aspect of it. Regrettably, it often seem I can get some people some better but not enough to get them back to work.